When we hiked up to Snow Lake a couple of weeks ago we discovered Source Lake. The Source Lake Trail branches off the Snow Lake Trail where the switchbacks start in the trail. I remember thinking “Source Lake” is such a generic name. If you are in the mountains the chance is good that what you are looking at is a source for something downstream. However, I later learned that this lake is the source for the mighty Snoqualmie River! Yessiree. This tiny pond is a roaring river by the time it reaches the famous Snoqualmie Falls! One the way back down the trail last time we took a quick side-trip to the Source Lake Overlook. We stopped just above the lake but we heard from other people on the trail that you can go beyond that point and there are some great loop trails up there. This last weekend, we decided to get up there again to check it out before we would be snowed out. The hike up was better than last time because the trail was drier and many of the stream crossings were gone. However, it was drier because it was really cold and, I assume, that the water had started to turn back into ice higher up. 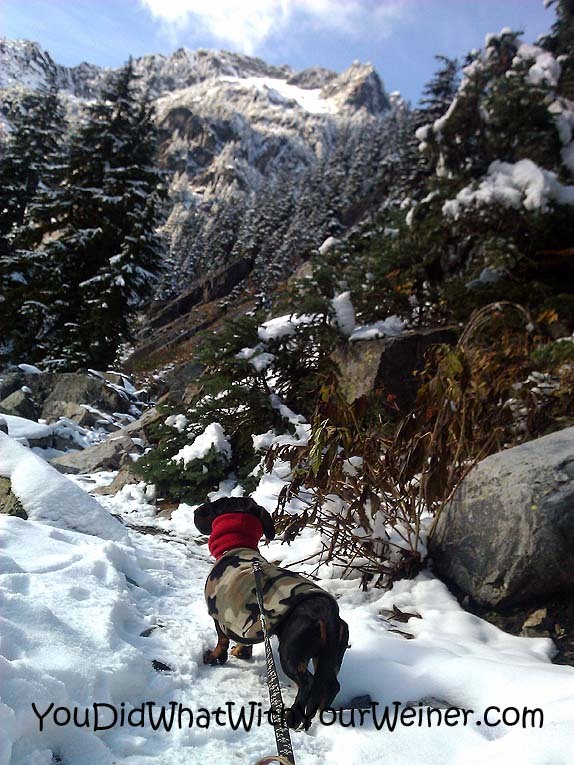 It had snowed last week so there were a couple of inches of snow on the trail this time. We hiked up to the lookout over the lake again and took a snack break. Chester and Gretel were cozy warm this time (compared to the shivering they often do in the snow) because in addition to their double fleece jackets from The Cozy Hound they were wearing their new fleece neck koozies (yes, like a beer koozie. Ha, ha) I made them. They were super spoiled this time because I also brought the Ruff Wear Highlands Bed we got for them to stand on instead of having to keep their cold feeties in the snow. After taking in the view, snapping some photos and eating lots of yummy snacks we were prepared to explore those new trails. When I stood up and looked across the rock slope for the trail I didn’t see it. Up to that point I had followed the footsteps of others in the snow. It looked like no one had gone beyond this point because I couldn’t find any footprints. Since I was unfamiliar with the trail, and I didn’t know how deep the snow was beyond this point, I decided it was better that we turned back instead of risking getting turned around or lost. I was a little disappointed we didn’t get to explore new territory. That’s ok though because it was one of those amazing, sunny, bluebird days and the mountains looked amazing with their fresh dusting of snow! I am so excited for the beauty of winter now! You got to play in the snow!! I can only dream of that – sigh!! You look so cozy in your fleeces!! I am even considering trying the booties thing again 🙂 THAT they won’t be thrilled about I am sure. ha, ha. Love the neck koozies. Good idea. They seem to like them too. Oh that is beautiful country! My Human is afraid of heights so she is very careful about getting too close to the edges of things. Chester and Gretel sure look comfy on their bed! P.S. Chester and Gretel didn’t have boots? Snow feet are the worst! Bet they don’t like boots. Chester has never liked booties. I have never had trouble with his pads or feet, although I am sure they get pretty cold. Dachshunds have such meaty, big pads that there isn’t much room for anything else on those feet. Snow has never stuck between their pads. I did start using Musher’s Secret a couple of years ago. I don’t know if it helped but I am sure it doesn’t hurt. I am rethinking the boot thing again….partially because they are cute. Ha, ha. With their twisted little feet I have never found a boot that fits well. Ooo we’ve always wanted to try Musher’s Secret. I heard it’s good for when you take the dogs biking on pavement. And they look so adorable, as always, in their jackets and scarves. 🙂 We need to move to Washington — you’ve got such beautiful places to explore!! I vouch for Musher’s Secret! Oh my that looks chilly! 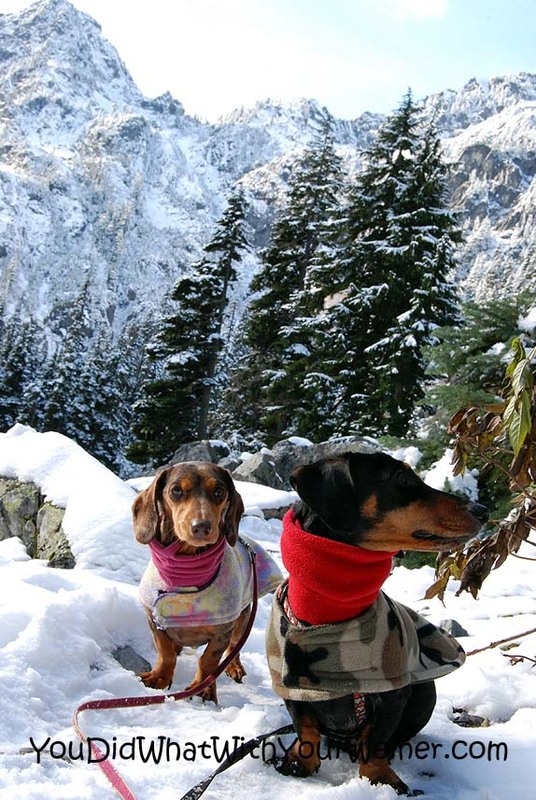 I desperately want to get those coats (and make koozies) for my dogs now. Too bad they have double coats already. Seriously, those photos are just wonderful! What amazing scenery you have there!! No snow here in Virginia yet. I’m not ready for it, so that’s ok. It sure makes things pretty though. I always complain how cold it is when it first snows but then I just learn to dress warmer and enjoy the beauty! 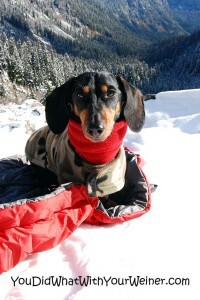 I have serious winter doggy clothing envy! Sometimes I wish I could put a fleece jacket or cute little doggy neck gaiter on Mochi… her genetics help insure she’s better off than I am in the cold. Hahaha! wow, gorgeous scenery! I want to go to Seattle and hike! 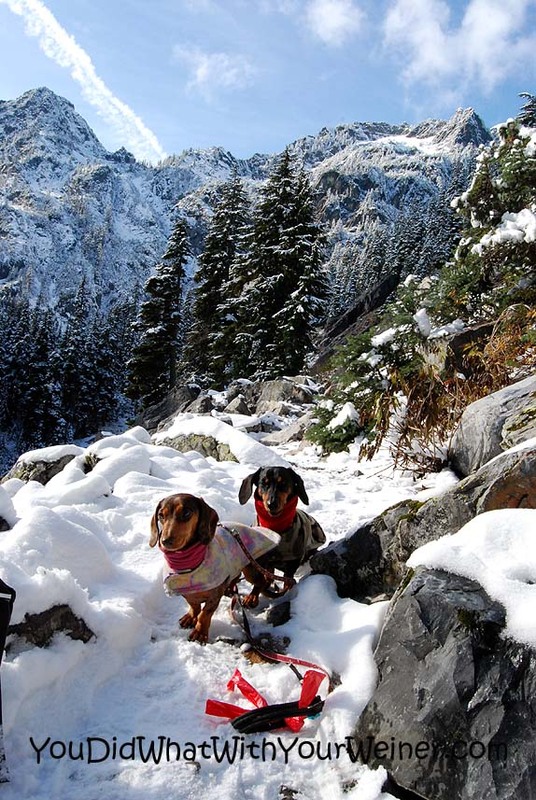 The dogs look adorable in their little outfits and the mountains look so pretty with the snow. I’m sorry the longer hike didn’t work out, but it definitely looks like you still had a great day. Yeah, we really couldn’t have asked for a better day. Short hikes can be fun too because you can get home sooner and still have the rest of the day to do something else. Beautiful country you live in and your puppies are so lucky to be able to go…..thanks for commenting on my east coast blog recently…always nice to have a west coaster(lol) explore my doodle world. My dads tented on Cannon Beach many years ago when they jumped in a van and “headed west young men head west”. They talk about it all the time…maybe sometime they’ll take me. They also biked the coastal route too…again no stopping them talking about that either….Really if I’m not there then did it really happen. 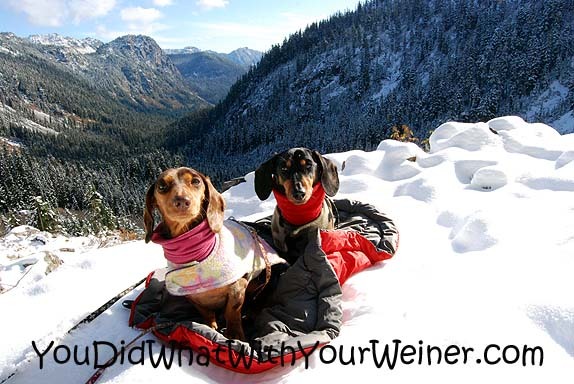 I think I’ll put you world on my side bar and promote the living daily lights out of you guys…you little weiners! Yeah…when I looked at some of your other posts it started to look less and less like the Oregon Coast 🙂 We have many stories we relive over and over again too 🙂 It’s usually the trips that don’t go perfectly if you know what I mean. They are the second kind of fun – way more fun when you come home and tell the stories. Like our trip from Astoria to Cannon beach on the bikes for example. Ha, ha. We are glad you like our stories and thanks for adding us to your sidebar!